During the early 1900s, express passenger traffic continued to grow. As well as increasing traffic, newer heavier coaches were being used along with restaurant cars and sleeping cars. 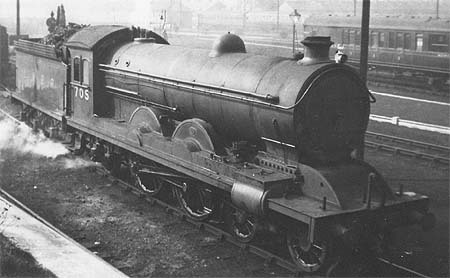 The North Eastern Railway (NER) introduced two 4-6-0 classes (B13 and B14) to haul the heaviest express services, but neither proved particularly outstanding. By 1902, the GNR expresses were arriving in York hauled by C1 Atlantics. Also Wilson Worsdell had just returned from visiting the USA and had been impressed by the Atlantic locomotives that hauled the Pennsylvania Railroad's expresses between Philadelphia and Atlantic City. Together, these two Atlantic designs inspired Worsdell's Class V locomotives, designed to haul the heaviest of the East Coast express services. The first Class V, No. 532, was completed in November 1903, and was followed by nine more over the next 12 months. The Class Vs had a large 5ft 6in boiler of the same diameter of that used on the C1s, but without the wide firebox. No. 532 was originally built with a low cab roof. This looked incorrect and also restricted the forward view. Within a month, No. 532 returned to Gateshead Works to have its roof raised. Deeper windows were added, and the safety valve 'tails' were straightened out. Previously they were cranked to bring them level with the cab roof. The whistles were initially on the roof, but were repositioned onto a pipe projecting through the front of the cab. Due to the poor performance of Worsdell's D21 4-4-0 design of 1908, he switched back to the Class V design for the next batch of express locomotives. Hence a second batch of ten was built in 1910. These had some minor differences, resulting in an NER classification of V/09. Most significantly, the cylinder diameter was reduced from 20in to 19.5in. The main frames were also strengthened at the front end, and the splasher design was modified. Both batches were built with saturated boilers. Between 1914 and 1920, new boilers with Schmidt superheaters were fitted. These new boilers were interchangeable with those used on the C7 (NER Class Z) locomotives. From December 1931, Diagram 48 boilers with Robinson superheaters started to be fitted. Eventually, fourteen C6s would carry the Robinson superheater. During NER ownership, the C6s and C7 Atlantics appear to have been officially treated the same, although the enginemen had their own opinions and generally thought the C6s were rougher in running. Fireman tended not to like the C6s due to higher coal consumption, but drivers tended to prefer the C6s on heavier trains because they were thought to be the stronger. By Grouping (1923), the C6s were still hauling the top express services on the East Coast main line, and were accordingly allocated to York, Gateshead, Heaton, and Tweedmouth. The arrival of Raven A2 Pacifics and Gresley A1 Pacifics resulted in a minor re-distribution between these sheds. In April 1928, four were allocated to Darlington to act as main line standing pilots in-case of failures of express locomotives. At about this time, the Tweedmouth C6s were used for the same duty. During the 1920s, the C6s were also used on fast freight services on the main line, until this work was taken over by K3 2-6-0s that were entering service. By 1930, the C6s were allocated to York, Darlington, Gateshead, and Heaton. The C6s were older than the C7s, and tended to work less demanding services during the 1930s. The Newcastle C6s were also seen more regularly on the Carlisle line. The next major re-allocation occurred in 1938, when they were displaced by V2 2-6-2s from the main line. The looming War probably saved them from immediate withdrawal, and they were re-allocated to Darlington, York, and Leeds (Neville Hill). In 1939, twelve were allocated to Bridlington and Scarborough to haul the Yorkshire coast services. The remaining eight stayed at Darlington. The Scarborough C6s were rarely used, and the Bridlington crews viewed the C6s as too large. The outbreak of World War 2 led to the re-allocation of some of the C6s back to Heaton and Gateshead, but withdrawals were imminent. Withdrawals began in January 1943 with the scrapping of the first C6, No 532. Re-allocations continued during the 1940s, including two to Dairycoates and ten to Springhead in 1943. Withdrawals continued, with only two C6s surviving into Nationalisation. These were both withdrawn in March 1948. The following details are the first batch (NER Class V). 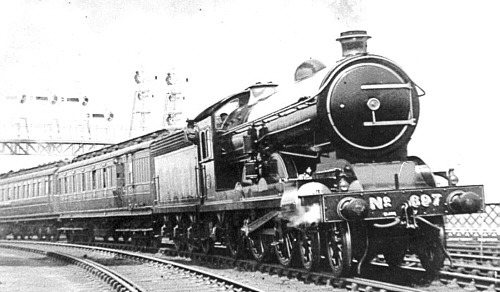 The second batch (NER Class V/09) had 19.5x28in cylinders and a quoted tractive effort of 19,350lb. Heating Surface: Total: 1875.4 sq.ft. None of the C6 locomotives survived into preservation. I am not aware of any ready-to-run models of the C6s in any scale. However, a number of scratch-built and live steam models do exist. The National Railway Museum owns a 1" scale Class V, and a 3.5in gauge V/09. Paul Mann (Leeds SMEE) has also recently won trophies with his live steam, coal-fired 5in gauge Class V/09. Thank you to Mike Morant Collection for the colour illustration of the NER Class Z (LNER Class C7). Thank you to Malcolm Peirson for the photograph of No. 697. Thank you to the Rosewarne family for the photograph of LNER No. 705.